The world is a savage place. The woman in the clip above got 60 days' jail when she flew into a rage at not being able to get McNuggets. She smashed glass, tried to punch out the employee, and so on ... proving that Thailand doesn't have a monopoly on those who would tear up the town when they can't get what they want right away. So yes, I have in fact receiving some astonishing threats and yes, the police have been looking out for me lately. In fact, the added vigilance on my street, owing to the fact that I am under police protection, caused them to stop and search me on my way to my house! Gotta watch out for fake Somtows hiding out among the fake DVDs and Rolexes. Although I don't mind at all when people comment on this blog and have occasionally even had my mind changed as a result of someone's comments or fact correction, The night of July 30 was unusual in that I received five really virulent blog comments in a row. They were all about how "the reds" were going to splash my blood all over Rajprasong intersection and cut off my head and so on. The comments caused my family and friends to get worried and regretfully I closed off the comment section and handed the threats (along with their suspected IP) to the police just in case these threats were actually serious ones. Of course, anyone who reads this blog would be aware that I have been critical of most of the protagonists in this sorry situation. Indeed, I gave an interview on the yellow shirts' TV station last week in which I spent much of the hour as an advocate for the opposing viewpoint. Meanwhile there's another "white paper", this one from Chatham House ... well, more of an essay ... which, unlike Mr. Amsterdam's, makes more of an attempt at evenhandedness. I've already received a note complaining that Thaksin's "paid them off" but that may well not be the case. Rather, I think that it's struggling to achieve balance. It's just that it starts from a place of utter pessimism. It might be a useful stance to take at times, but personally I don't think it's that helpful to the country right now. Find the right balance between cynicism and hope is important right now. I decided to escape with some of the members of the Shounen-Thai Quartet to the Burmese border, because I'd heard that there's an incredible flea market right on the edge. 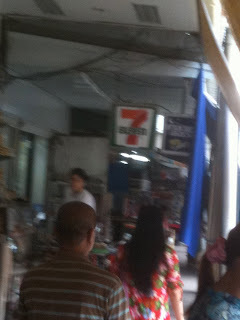 My dreams of anonymity were crushed when I walked into the Wiang Inn Hotel in Chiangrai and was immediately greeted by "I saw you on TV last night...."
It is instructive to note that one of your last sights on crossing the border is a 7-11 sign. Burma didn't look, on the surface, to be much different, but their border town had nothing like a 7-11, or an ATM. 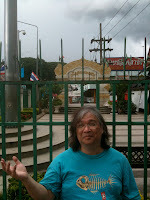 Whereas the Thai side had several of both. And of course much newer-looking cars. The Burmese side had beautiful people, and vast shops full of every pirated DVD you can imagine for $1, including rarities like one about Elliot Carter, complete CD boxed sets like Solti conducting the Bruckner Symphonies for around $5 and so on. There were also plenty of fake Rolexes and Omegas. Some jade too, perhaps mostly fake, though good jade comes from Burma, as we all know. I bought a beautiful jade bracelet at a price where it didn't matter if it was fake or not. But I have to say that to me the most disorienting sight was the one below: a shop selling lovely hand-painted Buddha icons on pieces of old teak (perhaps planks from one of those old-style houses) for about $1 a piece, with an extraordinary, primitive-style Crucifixion hanging beside them. The juxtaposition of the suffering Jesus with the serene Buddha seemed somehow to crystallize the feelings that this strange outpost aroused in me. It made me think, too, about the nature of dreams, and of freedom. Everyone always dreams about "another place". As a science fiction person living in L.A., I met many Americans for whom "another place" was not even on earth. "I dream," they would say, "that one day I will go to the Moon. Or settle in an L-5 colony." I also knew many Thai people who had had their own version of this dream. "I dreamt," they told me, "of emigrating to America and opening my own restaurant." When I was standing across the bridge from Thailand, an imperfect democracy where many have yet to learn to control their rage and to start using the political process in a constructive way, a country where fake DVDs cost ten times as much as they do in Burma.... I got to thinking ... once I cross that bridge, I'll be able to walk into a 7-11. Could that, too, be someone's impossible dream? Do we dare to take anything for granted in this world? I think it was Bernard Crick who said that democracy is an elastic term - in Thailand it is stretched to the very limit of it elasticity. Read a lot about this in the news in my country (Philippines). Nice to read a point of view from someone who's experiencing it firsthand. We all take many things for granted when we have them, there is no perfect democracy yet it is better than none... There isn't a perfect culture but many beautiful cultures that make them perfectly imperfect thus unique with all thier values and ways.